I probably knew Davey was the one for me when I spotted two gigantic jars of marshmallow fluff in his otherwise bare refrigerator in the early days of our dating. Seeing them took me back to me first rendez-vous with the creamy white stuff (ewwww, I really really don’t know a better way to say that). My dad used to regularly house a jar of marshmallow cream in our pantry alongside a box of graham crackers. Dessert for him included either a giant tin of those Danish butter cookies that aren’t realllllly that good, but the size and different shapes trick you into eating 32 and deeming them delicious, or several graham crackers smeared with marshmallow cream. S’mores without the chocolate. And usually anytime you string together the words “without the chocolate,” I’ll just go ahead and pass, but there was something simple and yet dreamy about the little confection. Recently my dad told me he inherited the marshmallow-graham trick from his dad, which made it warm my heart even more. Three of the greatest, most important men in my life with a shared love for a chemical and sugar-laden jackpot of goodness (oh, and Jesus)… I’m sold. It’s a mouthful. But it’s a mouthful of Heaven. I’m not even trying to stray into PG-13 world with that statement (I mean, I could, but it’s just distracting us from what’s most important… the cake). I really mean it. This cake is really, really, really good, and it was an accident. I have a lot of accidents (don’t even ask me what happened at the farmer’s market this summer that required setting my basket on the ground, taking an emergency Target trip and a reclamation of my produce at a later time), but when the goal is to celebrate Davey the Hubber’s birthday in a magically sugar-filled way, I at least try to have a strategy. This cake’s strategy was: all of the good things. So at least that gave me a baseline from which to work. 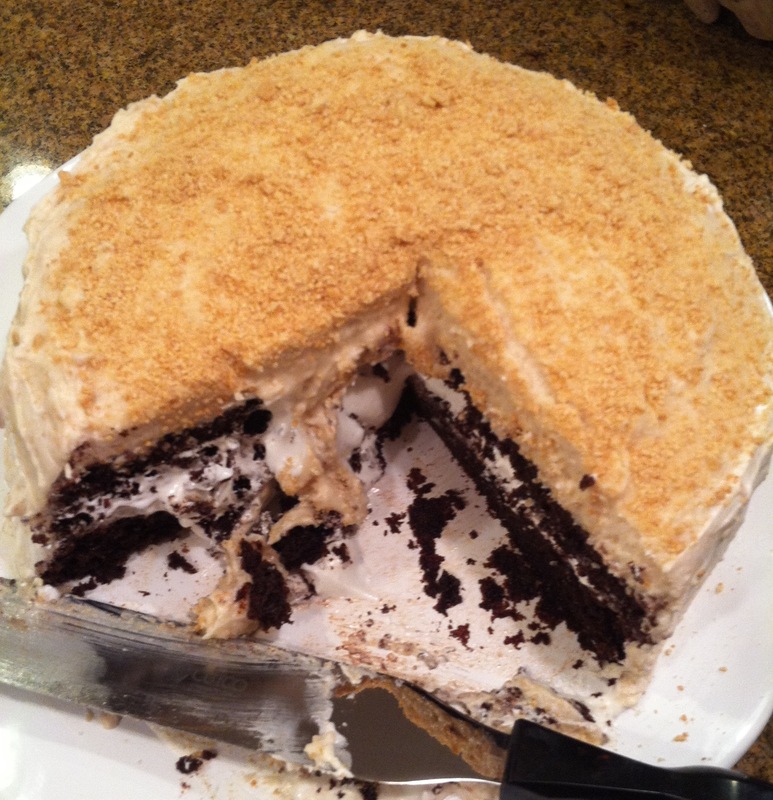 “Good things,” in this case, required dark chocolate, the aforementioned marshmallow fluff, honey and graham crackers. I wanted to combine them in a way that didn’t scream “Hey, look at me! I’m a trendy s’more but not as good as an actual s’more, so sorry I’m teasing you like a prosti-tot.” So I’m not calling this a s’more cake. Because it isn’t. It just happens to have all the same components. An homage, if you will. As part of the confectionary mayhem I Frankenstein’d marshmallow fluff and cream cheese, which is probably the best thing I’ve ever done aside from picking out my wedding dress and saying yes to DTH’s proposal (not necessarily in that order…). If you don’t have the time or wherewithal to make the entire cake, at least mash up some fluff and cream cheese and eat it by the spoonful, or put it in a little bowl and call it fruit dip. Preheat oven 350 degrees. Grease and flour 2 round cake pans (I used 9″). Combine dry ingredients in mixing bowl then beat in eggs, yogurt + water (or milk), oil and vanilla. Beat well. Add boiling water. Divide batter (will be thin) equally between cake pans and bake for 35 minutes. Allow to cool in pans for 10 minutes, then remove cake from pans and allow to cool completely on a wire rack. Beat together cream cheese and marshmallow fluff. If it tastes too much like cream cheese after an entire fluff container, add a few more spoonfuls of fluff until you’re satisfied with the ratio. Set aside until cakes have cooled completely, then use as a filling between the cake layers. Store extra in the refrigerator and smear all over graham crackers at a later date. In a food processor, grind graham crackers into fine crumbs. Set aside. Beat softened cream cheese and butter until fluffy. Slowly add powdered sugar, 1 cup graham cracker crumbs and vanilla. Beat well. Add honey, yogurt and 1 tablespoon water. Add additional water until consistency is spreadable. Frost marshmallow cream-filled cake. 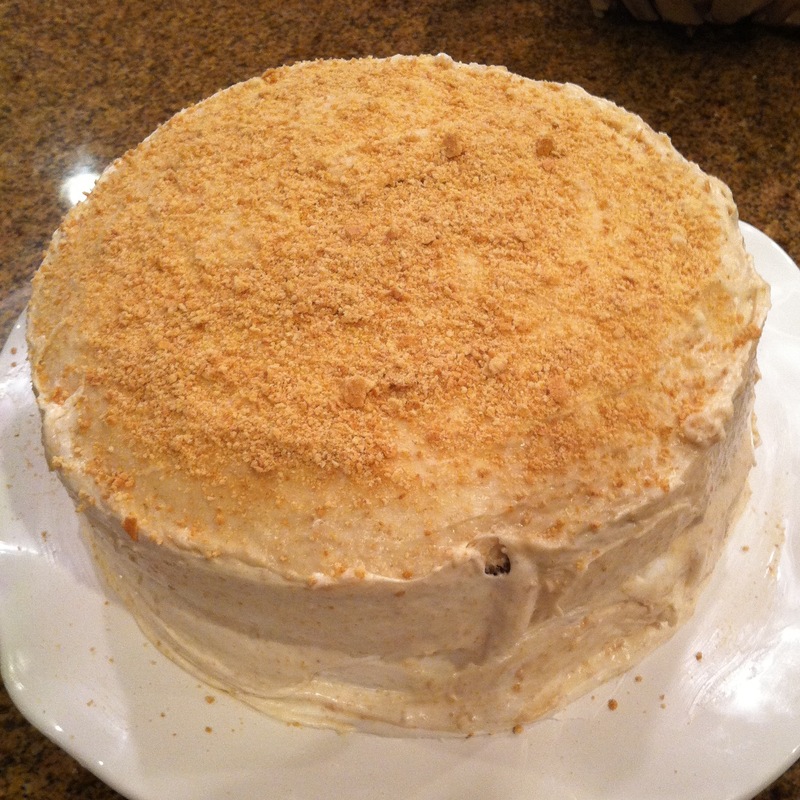 Top cake with additional graham cracker crumbs.